I know that I’ve started recovering from my lengthy illness as I’ve started to get some painting mojo back, although I’ve probably done more building of models than painting in the past few months. 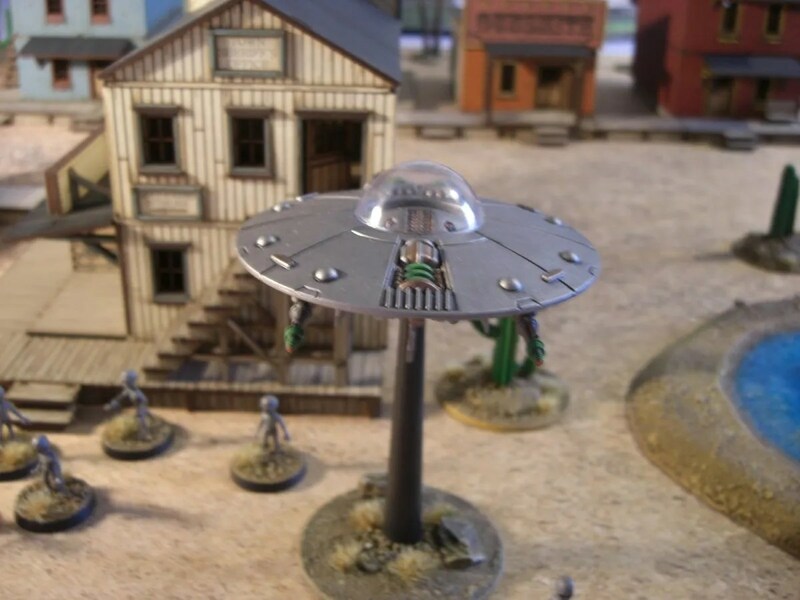 Having discovered the simplicity of a post apocalyptic game called ‘Mutants and Death Ray Guns’ by Ganesha Games – finding that it’s a game my wife enjoys and we can play a game in under an hour – I’ve been putting some pieces together for it. I know I’m late to the party with this, but Ganesha Games do quite a bunch of variants for different eras, so we’ve also taken to playing Flashing Steel (a piratey/swashbuckling variant) and Song of Blades and Heroes (a fantasy version which I think was the first set of these rules). Now I’m hoping they’ll hurry up and translate the Italian Wild West version as well. 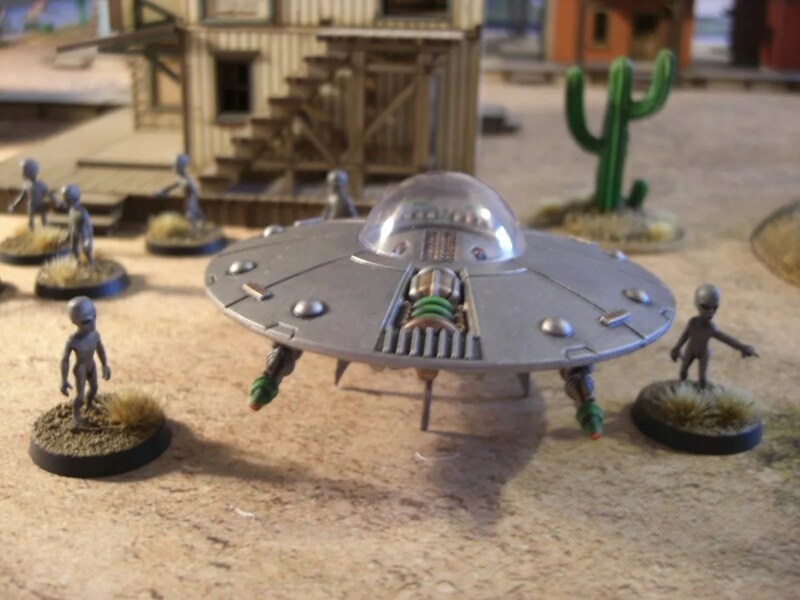 With the Kickstarter for Tombstone , I’ve been inspired to also build a Wild West themed board – some of which you’ll be able to see in the background of the photo’s below. I still have a backlog of models to take photos of, but as I had the case of figures open to put some MDRG away, I popped them on the table and took some photos. The light was bad and I used the flash a few times, so apologies for the quality. I need to stop buying plastic/metal/resin/mdf models and save for a decent camera and light box. 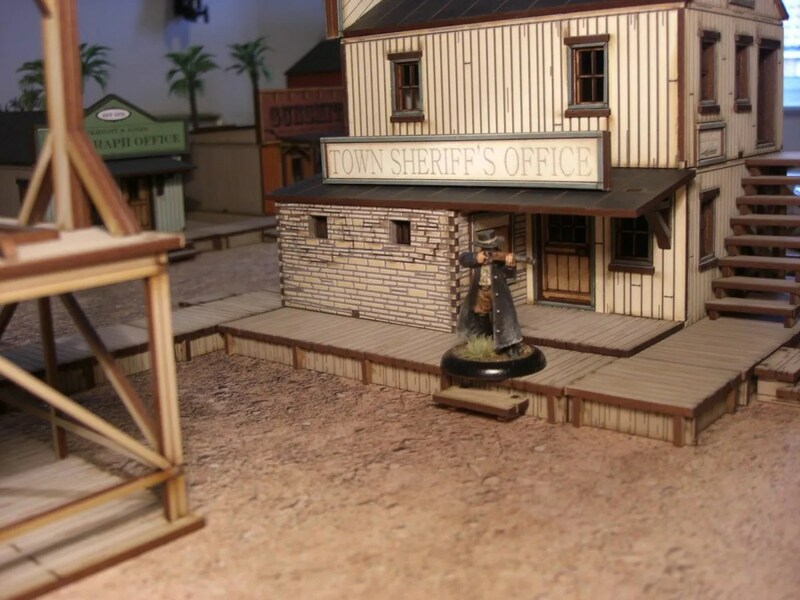 Here’s the first Western figure I tried painting next to the Sheriff’s Office. 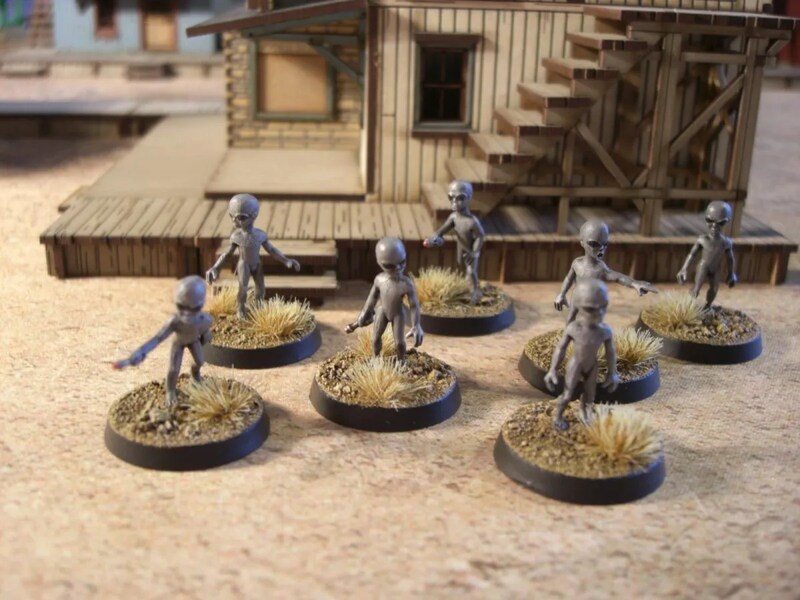 Although for our first games of MDRG, we used Mutants (using Deadzone figures) and Humans (using GW Chaos Cultist figures), the first band I painted up were some ‘Greys’. The ship is just a piece of themed terrain for the game and isn’t used as such. 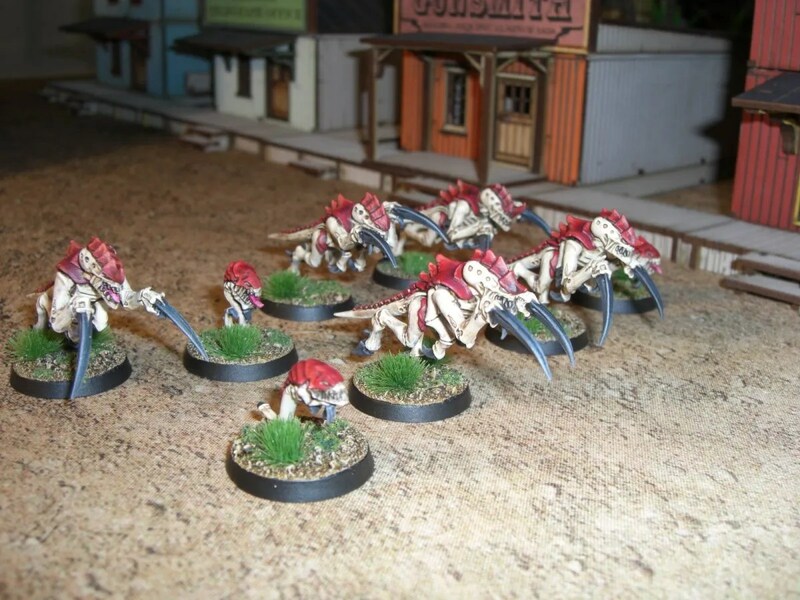 After that, I had the urge to paint some GW Tyranids. I never wanted to collect an army of these ever, but always fancied trying out that red/bone colour I see so many photos on the net. These are going to be used as Xeno-Parasites in MDRG. 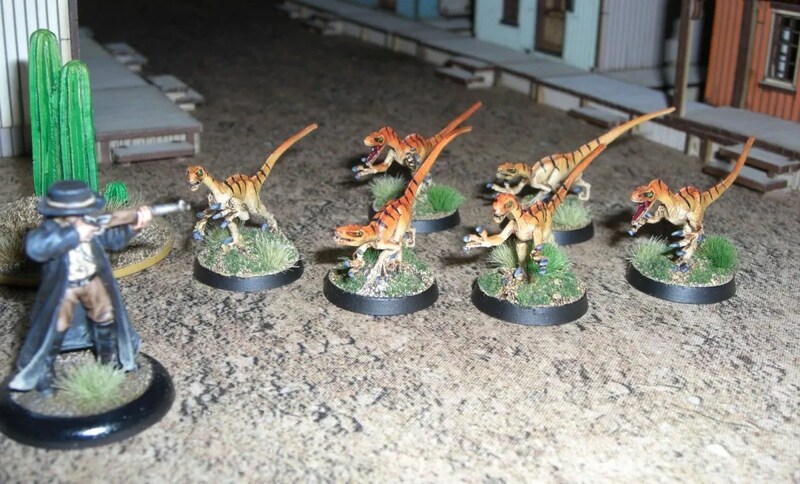 Finally, a couple of pictures of my MDRG gang of Raptorz. It took an age to find some models to use for these, in the end, the ones I liked the best were from Ral Partha. 2 sets of 3 make a perfect sized pure band of 6 for MDRG. I saw some painted in a tiger-like scheme and that was it, my mind was made up. Base coated Bone, an airbrush of yellow towards the middle to top, then an airbrush of orange on the top. 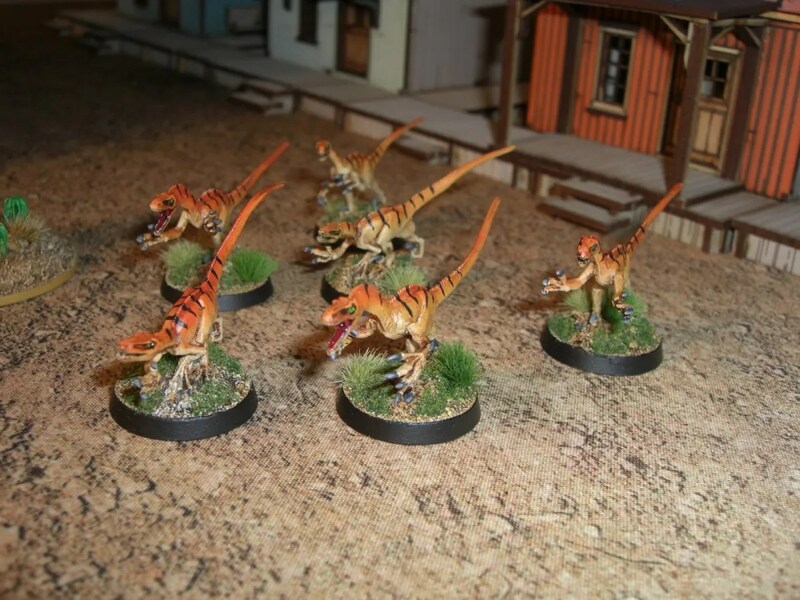 Washed with soft tone, then add stripes, claws and eyes and these things were painted rather rapidly. Good enough for my ageing eyes and shaking hands anyway. Anyway, I’ve built 6 different 4Ground Wild West buildings and a fantasy inn for the Pirate games… It’s time to peel off my 2nd skin of PVA and get some painting done.